As a merchant, you’re probably always on the hunt for the most effective ways of driving traffic to your store. Hands down, Google is the largest and most powerful search engine in the world. We’ve made it a piece of cake to use that to your advantage. 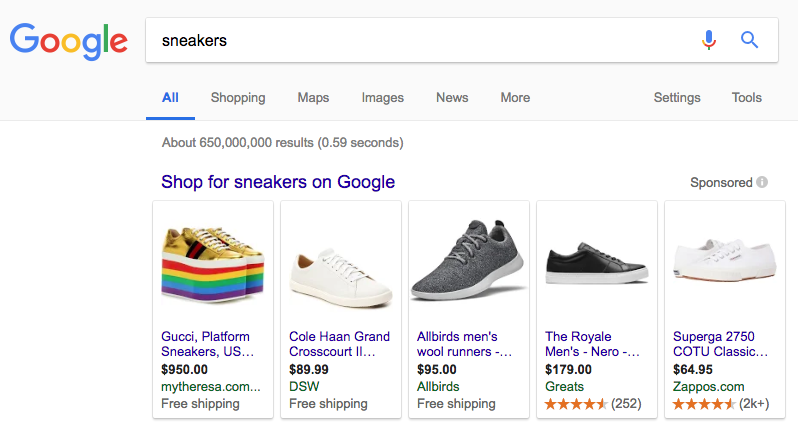 Now, you can run automatically optimized Google Shopping Ads to market your products to shoppers at the moment they start searching. Fully automated advertising. Campaigns are built and optimized for you, completely hands-free. Easy to use for everyone. Yes, even if you have little to no experience in e-commerce. Our step-by-step wizard will help you to set up a campaign and start selling. In this article, we’ll explain how the new Google Shopping integration works and how your Ecwid store can benefit from it. If you can’t wait to try the new functionality, feel free to go to the Control Panel and follow the wizard. Google Shopping Ads allow you to create a paid advertising campaign, which displays your product information. This is an image, title, price, and your business name when people search for products online. Depending on your advertising budget and how frequently you want your Google Shopping Ads to appear, you can spend as much or as little as you like on these campaigns. Quality leads. You’re more likely to attract potential customers who are looking for exactly what you sell. Increased site traffic. Ads funnel customers directly to your website. Higher click-through rates. Customers are more likely to click on images than text when shopping. Lower click costs. You can continually refine your bidding strategy for your campaign to spend exactly what you want to. Reaching shoppers across the web. Your ads will be shown to people who are looking for your brand and products on Google.com, Google Images, and YouTube. That’s it! You’ve created a paid advertising campaign, fully automated and optimized right from your Ecwid Control Panel. There’s nothing more for you to do except tracking the results of your campaign in your store dashboard. All Ecwid merchants on the Venture plan and higher can connect to Google Shopping. To list your products with Google Shopping go to the Ecwid Control Panel → All sales channels → Google Shopping, then click Enable. Then click Get Started in the welcome screen and complete all the necessary steps. Visit the Ecwid Help Center for more details. As always, the Ecwid support team is available to assist if you have any questions. By all means, we recommend using our new automated Google Shopping solution. However, you may want to generate your products feed in Google format to manage your listings manually in Google Merchant Center or other marketplaces. We are keeping this opportunity available for you. If you still want to manage your campaigns manually, generate and download your product XML feed in the Google Shopping format and upload it to your Google Merchant Center. This is also available under Sales channels → Google Shopping in your Control Panel. Thank you for reading the whole piece — it means you are interested in selling on Google Shopping! We’ve prepared a special deal for the first 1,000 participating Ecwid merchants — a FREE $150 advertising credit voucher from Google! Spend $150 within 31 days and we’ll automatically top up your account with an additional $150 worth of advertising credit. The offer is valid for new Google advertisers only. Take advantage of the offer and let us know in the comment section what your experience has been with the platform.